Come DIY with me at West Elm! Can you believe it? It's the holiday season already. Nothing brings me more joy than burning Christmas candles, listening to Frank Sinatra on the record player and over decorating our apartment with garland, lights and tinsel! Plus, I remember saying to myself last Christmas, "This time next year I will have a six month old baby..... weird." And, here we are people. It's almost time to hang those stocking with care.... and I indeed have a nearly six month old tiny person. And what better way to jump feet first into the holiday spirit than with a little DIY! If you're going to DIY just one time this year, this is that time. Join me and my partner-in-crime, Hannah of Hannah Kate Flora, as we show you how to make personalized monogram napkins (or pocket squares.... if that's more your thing). 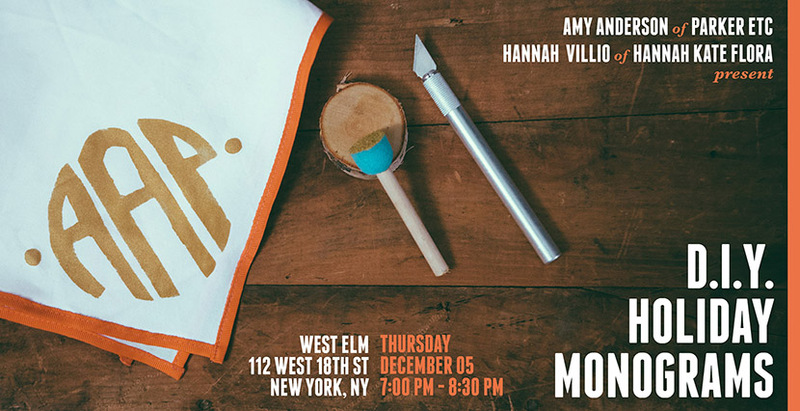 The lovely folks over at West Elm are housing our little gathering, so you know it will be cozy and festive! This is that perfect DIY for your holiday dinner table or for that last minute present (we all have that hard to buy for person!). Plus, I'm never one to DIY empty handed, so bubbly and treats will be on hand! Be sure to sign up soon, as space is limited and the day is fast approaching. We would love to see you there! *Cost includes all your necessary crafting supplies, a napkin or pocket square, bubbly and snacks. Participants will also be eligible for an in-store West Elm discount to be redeemed at the class. What better time to stock up on holiday gifts for your family!